The Mitchell & Son wine merchants started their business in 1805. At first, they set up a bakery and confectionery on Dublin’s Grafton street. But with the rise of demand for Irish Whiskey in the Victorian Whiskey boom era, they soon entered the Whiskey bonding business. What they did is purchase newly made Whiskey under bond to mature and bottle it themselves, before selling it under their brand. By doing so, they evaded paying the excise tax. It’s unknown when exactly Green Spot was first produced, but by the 1920’s Mitchell & Son had bottled over 100 Sherry casks of Whiskey per year. Usually the Whiskey was matured for five years in casks by the distiller and later blended, then matured by the merchant for at least five more years, depending on the ‘Spot’ brand name. The name comes from the practice of marking the different ages of casks with a different color. Green Spot Single Pot Still bears no age statement and is composed of Pot still Whiskeys aged from 7 to 10 years. The Whiskey has been matured in new casks and ex-Bourbon barrels, as well as the ones that contained Sherry. This much appraised drop of Irish Whiskey has become a cult favorite. What does Green Spot Single Pot Still taste like? The Flavor Spiral™ shows the most common flavors that you'll taste in Green Spot Single Pot Still and gives you a chance to have a taste of it before actually tasting it. Fresh aromatic fruits and oils, paired with barley and toasted wood. The contribution of Sherry casks is more than present. A sensuous spicy body with fruity notes of green apples, pears and apricot, rounded with the presence of mellow grain and coconut. A moderate length finish that brings out the notes of spiciness and the pot still character. Oak, Sweet, Barley, Fresh, Coconut, Grain, Sherry, Smooth, Apples, Caramel, Warm, Apricots. Once paid $30 for one shot. Well worth the wait. For the price, this is easily one of the best Irish Whiskies our there. Smooth, almost buttery, a must for every home bar. This is great! Smooth with a little extra spark behind it. Probably my favorite Irish whiskey so far. Very strong apple and pear notes without the overpowering spiciness typically associate with Irish whiskey. LOVE IT!!! All time favorite!!! For the price; I absolutely love it. Neat. To sweet to mix. Fine, but not stellar. Very golden and grassy and sweet, but not a lot of complexity. If given the choice, always take the Red Breast 10 yr.
Nice balance of flavor, great nose, smooth to the last drop. I usually go for bourbon and American whiskeys and a few ryes. I found this to be a very light, enjoyable drink, either neat or with a cube. I highly recommend it. It is an outstanding, intense, Single Pot Still Irish Whiskey a fresh & aromatic birth; while warm & spicy life; leads to a long & creamy death. Smooth, delicious, amazing, especially for the price. I enjoyed the Green Spot very much. Nice & smooth. Love the apple. Fresh apple, spice. One of my favorites to sit back and enjoy. 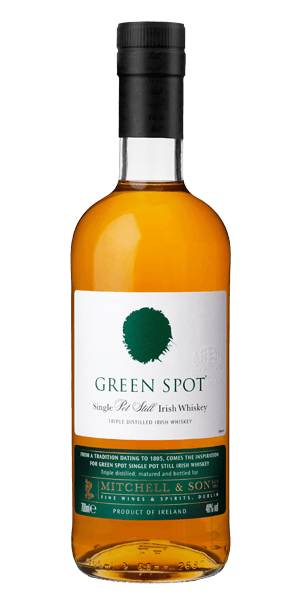 Not much detail I know but if you like Irish whiskey you have to try green spot. This is my second bottle of Green Spot. It is always in my bar at home. It is an excellent single pot still Irish Whiskey. I like it better than Red Breast 12 yr. It is easy to drink neat. The finish is smooth and creamy with hints of vanilla. Holy moley! This is the one. I love Redbreast, but this has a smoothness and sweetness that makes it a touch above. Get this. I thoroughly enjoyed this bottle. Easy to drink with a hint of sour apple on the finish. This is a fantastic Irish whisky with a very long finish. It's a desert island favorite. Sometimes when you can't get the thing you are really looking for, something else shows its pretty litte face, for me that was this whiskey. I usually enjoy Jack Daniels. I thought I would try something in the Irish Whiskey area. Once I got past the first bite, it was a sipper and relaxing for the rest of the evening. I noticed my local Liquor Store sells it now. Now I can save the shipping charges. Very smooth and easy to drink. The green apple flavor is crisp and refreshing. Love it. Was not a big Irish whiskey fan before trying this one. Absolutely love the buttery-ness of this Irish whiskey. My go to when I’m feeling ‘neat’. This might be my favorite Irish Whisky. Apple, vanilla frosting on the nose. Pound cake, vanilla, buttery short bread cookies (biscuits) on the palate. Very smooth. I'm new to whiskey, but this is so far my favorite Irish whiskeys! Probably the best whisky, of any kind, that I've ever had. Flavorful and very smoothe & mild. I'll add a glowing review to this list. Just as smooth as it gets and a wonderful finish. I liken it to Jameson Gold. Definitely pick up a bottle of this and give it a try! Very smooth. A great whiskey for beginners and old hands alike. Highly highly highly recommend. Extremely smooth and is much different on the nose than on the palette. The penultimate Irish whisky. More robust flavor profile than its big brother. Great Irish Whiskey! Highly recommended. The hype is real. Definitely a favorite now. My favorite Irish Whiskey, and definitely up there amongst other varieties of whiskey. Lovely smells, great mouth feel, and a nice sweet/fruity finish! Currently it is my favorite Irish whiskey - richer in flavor than the average Irish fare, it drinks smooth, lightly sweet, and the color is lovely. Mellow at first sip. Easy to drink and just what I like...but so is Bushmills for 1/3 the cost. One of my favorites. This truly turned my eyes to Irish whiskies for the first time away from most of the swill that is passed around, you know, the stuff that starts with a J.
I first was steered toward this gem when working in Galway. I instantly loved it but until recently it was unobtainable in the U.S. so when a friend revealed a bottle I flipped. It is a spectacular and fine whiskey irrespective of origins, age, cost, blended or single malt. I strongly urge you to try it. It fascinates the nose and palate of the inexperienced as well as the informed. There is a musty, old wood note that gives me a sense of history. Young but old soul'd.